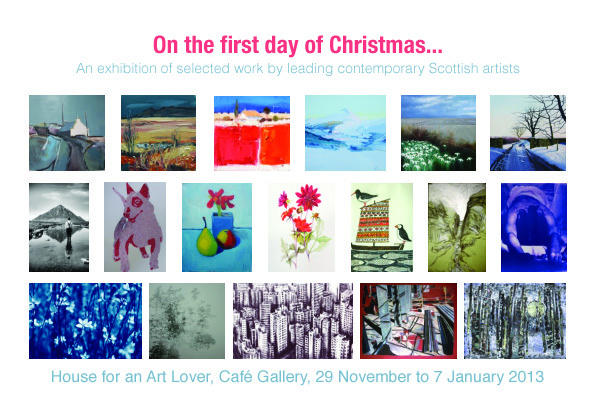 Exhibition at House for an Art Lover - You’re invited! Yesterday I dropped off some pictures at House for an Art Lover in Glasgow for their next exhibition, which opens on Thursday 29th November. 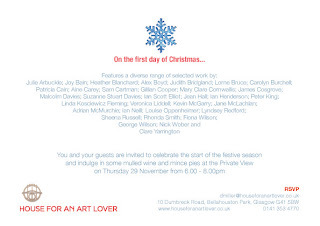 The Private View is on Thursday evening and if you’re in Glasgow, it should be worth attending. 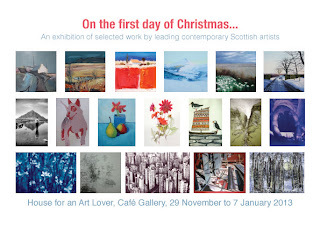 As well as my pieces, there is work by lots of other artists which looks really interesting. In some ways it was quite sad dropping off the work as now my mantelpiece looks empty. It’s not until you take the picture away that you realise what an impact it has on the room! Still, it will soon be time to put up the Christmas decorations there instead. It was all a bit of a busy day yesterday. As well as dropping off the pictures, we went to the Studio, running by the Loch Lomond Quilt Show people to see their first City & Guilds Patchwork and Quilting exhibition. It was very impressive work and as I’m teaching the next C&G course with them which starts in January, it leaves a lot to live up to – which is fantastic. The children liked the quilts, but were even more impressed by the cakes! 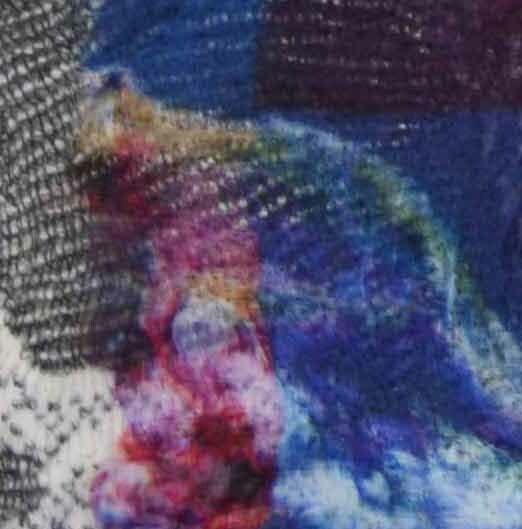 This week has been lovely as I managed to have three days in the studio, just concentrating on my own work (sorry to anyone who was expecting work or tidiness from me this week...!). Having spent a lot of time mulling ideas over, I finally bit the bullet and got stuck into making. Nothing big so far, although I have now started some bigger pieces. These are little samples/pieces. Using a strategy that worked for me in the past, I decided to make do with the materials I had at home rather than obsessing about what materials I really, really needed to make the work. So rather than buying a screen and screen printing inks and getting some thermofax screens made, I used my runnier fabric paints (Jacquard Dye-Na-Flow, which I love) and the odds and sods of acrylic paint I had lying around. Before this all sounds too saintly, I have bought more procion dyes to increase the colour range of the background fabric and bought some additional acrylics when I was out on Thursday as I ran out of the colours I used in the samples! I really like the results of using the acrylics to mark the cloth after more subtly altering it with the fabric paints. I then added lots of free machine stitching on top. The other piece uses one of my least favourite fabrics: polyester net curtain fabric. However, the transparency works really well, more so than the silk I have here. Although I melted it a couple of times, I think I may work with it in the future. Mags Ramsay's Rule the Waves? 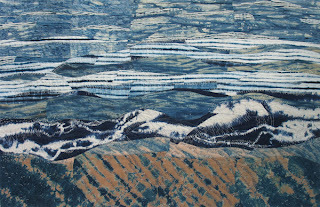 A few months ago, I showed Mags Ramsay’s quilt as part of my review of the Festival of Quilts. 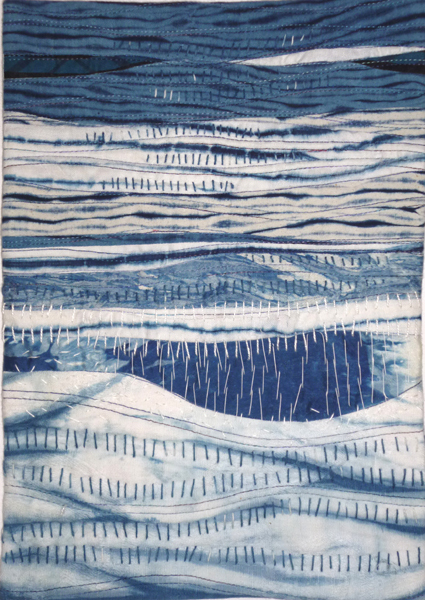 As photography is notoriously difficult at the Festival of Quilts due to the lighting, she kindly sent me a better image of ‘Rule the Waves?’. Margaret Ramsay - Rule the Waves? I have been rather remiss and am only just getting round to posting it on this blog. 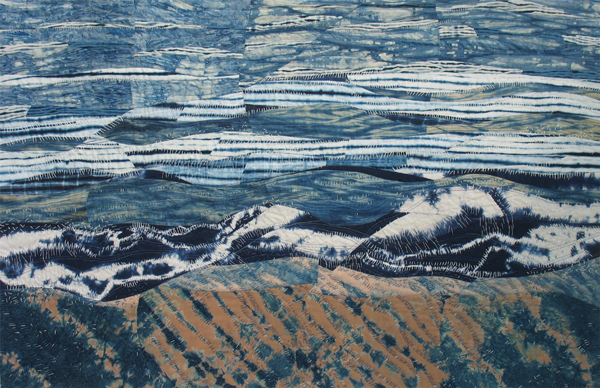 I met Mags at a masterclass with Chunghie Lee at the Festival of Quilts a few years ago and I have been following her work ever since. Her work is lovely and she is very prolific given she also has a full time (and interesting) job. She also writes a great blog, which is well worth a look if you don’t know it already. 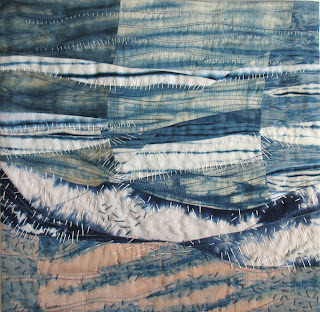 ‘Rule the Waves?’ is a really clever use of indigo as you get a real sense of the sea and of the horizon. 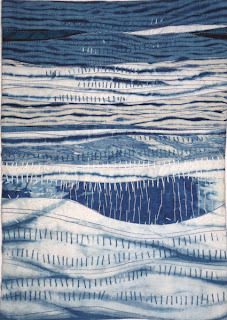 She also has emphasised it by stitching in indigo colours using hand stitch. I also like the long narrow format, because the sea is so vast, you could never portray all of it and by concentrating on a section of it, you have a better sense of the whole. Mags kindly sent me some other images of related work, all of which is gorgeous. ‘Weymouth Waves' is included in the SAQA regional exhibition ‘Wide Horizons II’. 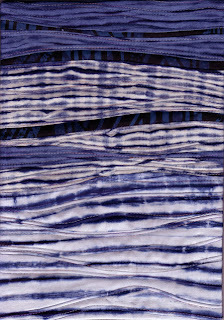 Indigo must be an up and coming trend again as a number of people I know are beginning to work with it. Ruth Higham and her group Threadlines are in the process of creating an entire exhibition based on indigo for the West End Festival in Glasgow and I’m going to visit them next week to find out more about it. Last weekend we held our third Big Draw event in Balfron. This year’s theme was ‘2012 in lines’. We had lots of different activities, from traditional drawing to less obvious interpretations. The mapping activity using masking tape on the floor was really popular with the children and we went through all our supplies of masking tape and some more! The adults enjoyed extending out and altering some black and white photographs of Balfron. Everyone seemed to like building 3D sculptures using paper straws and more masking tape. Of course, we had to have a textile activity and we had ‘Weaving Secrets’. 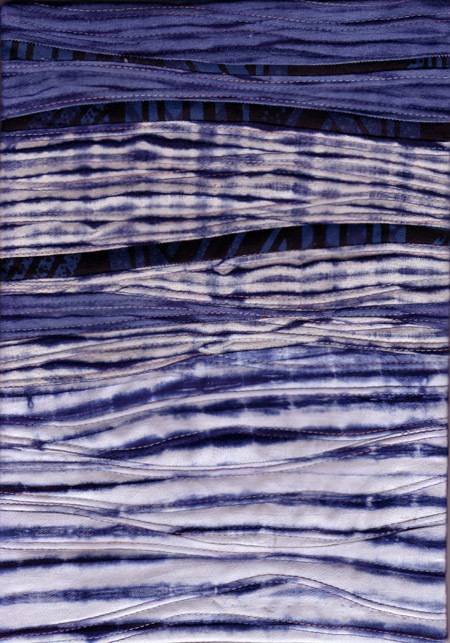 I had dyed some fabric and torn it into strips. We asked people to write a ‘secret’ on it and then weave it into the overall tapestry, leaving it up to them just how much or little of their secret they revealed. The tapestry frame was made from a borrowed quilt frame from the Loch Lomond Quilt Show and Luci of eventsdecor had generously donated some fabric. The finished result was really attractive, especially after I compressed it down to very small. When I tied it off it wound up beautifully and I’m enjoying having it on the window ledge of my studio to admire. Dawn, one of my fellow organisers of FAB, our local arts organisation, was suggesting we displayed it in the local library, but .... rather selfishly, I like it where it is!